For only 100 years women have had the right to in New York State. We were given small increments of that right prior to 1917 when we were given the right to run and vote for school offices and to vote on taxes, but we had to wait until 1917 for the State of New York to pass a law awarding us an equal voice in our government. For many women today it feels as if we have had the vote forever, but it has only been 100 years. Sometimes we do not take that seriously enough. Often I forget just how few rights my grandmother had when she was born in the late 1880s. She never mentioned rights to me and, now that I think of it, the country she grew up in had a monarchy and when she immigrated to the United States she never became a citizen so I doubt she ever gave voting the thought we did. I often talked with my grandmother, but not usually about politics. I came of age in the 1970s and with the Vietnam War, the draft, civil rights, feminism and a few other “hot topics” generating protests and sometimes riots most of us who could vote did so! We took it seriously. We had a voice! We were women and even if we did not “roar” we certainly made ourselves known. The passion for women’s rights felt as if it had cooled off in many quarters until recently when museums all over New York State began looking through their collections for objects, archival artifacts and other items to put on display in various exhibits. 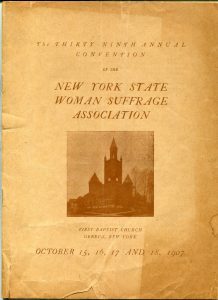 One of the archival items I found is a program from the 1907 New York Woman Suffrage Association Convention (NYWSA), which met at the Baptist Church on North Main Street in Geneva. Held for four days in October from the 15th to the 18th the program contains a photograph of Elizabeth Cady Stanton who called for the first Woman’s Rights convention in Seneca Falls, NY in July 1848. It also lists the names of many Geneva women who held offices in the NYWSA including Mattie Congdon, Verna Hemiup Haley, and Bertha Hallenbeck. Only New York City had more women residents holding positions as officers and chairwomen of Standing Committees. At a time when Geneva had between 10,000 and 12,000 people in the city and seventeen people from the city worked on the local committees, two of whom were men, S. H. Lewis and Charles Condon. This 110 year old program shows that on October 17 a reception was held from 4:30 to 6:00 pm at Lochland, the home of Elizabeth Smith Miller and Anne Fitzhugh Miller. This beautiful building is now the home of Lochland School. 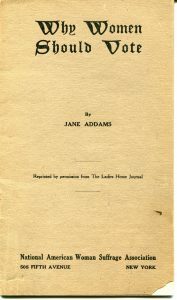 There were presentations, lectures and talks on the “Significance of the Movement,” “The New Demand for Suffrage,” “Working Women and Suffrage,” “The Hague Conference,” “An Italian Woman, Anachronisms,” and “Vital Political Issues and the Suffrage Reform with Finnish Illustrations.” Featured speakers included Harriot Stanton Blatch, Rose Schneiderman , and Dr. Anna Howard Shaw. The final talk was given by Prof. Nathaniel Schmidt one of several men who presented during the event. It would be another 10 years before New York State granted suffrage to woman and 13 years before the United States Federal Government granted the right to vote to women. These hard won rights should never be taken for granted. The women who began the movement did not live long enough to see women vote. Susan B. Anthony, Elizabeth Cady Stanton, Anne Fitzhugh Miller and Elizabeth Smith Miller all died before they had the right to vote in a Presidential Election. The least we can do is honor them by voting in each election. It is a duty as well as a right.